Lauriston Park B&B has now closed. Please email as above for information about short term room only accommodation in the vicinity. The contents of this website are shown for information only and some details may no longer apply. Built in the 1860’s, Number 6 Lauriston Park, Edinburgh, forms part of an elegant, ‘B’ listed period property in an enviable position. 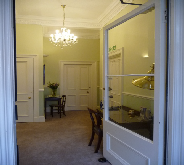 Enjoying a quiet, cul de sac location close to the Castle, the Meadows, Kings Theatre and EICC. 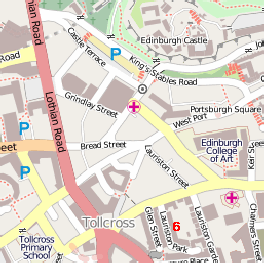 Other landmarks nearby are the historic Grassmarket and Old Town, Usher Hall, Film House its not much further to walk to Princes Street, Holyrood, National Museum and many other places of interest. If you are on holiday in this exciting City we hope you will enjoy the attractions and have a relaxing break. The close proximity to the Edinburgh financial district and EICC makes Lauriston Park ideal for the busy executive needing a central location. Lauriston Park is owned by Sarah Whitby and Alan Brown who took over the premises in late, 2006. Whatever your reason for staying we are sure you will be pleased. For information on places to visit and things to do in Edinburgh, go to our contacts page and visit the web sites listed there.